Part of what we love so much about Star Trek, and the original series in particular, is the lived-in camaraderie between the senior officers. But it’s rarely considered by fans and authors alike that those relationships took time to develop and endured a heap of growing pains in the process. Enterprise: The First Adventure, the first instance of what we will come to know and recognize as the “event novel”, takes us back to a time before that rapport was locked in, when the crew we know as legendary were almost torn apart by the vagaries of the rumor mill and each other’s baggage before ever having a chance to become the chums we know and love, and imagines that ragtag bunch thrown together for the first time. Published exactly twenty years after Star Trek made its television debut, let’s join Kirk as he learns on a particularly stressful first outing that heavy lies the wrist that wears the command stripes. As we enter the story, Kirk is closing the book on his relationship with Carol Marcus, hoping for a speedy recovery for his friend Gary Mitchell so he can make him his first officer, and getting wasted with an alien buddy before his own command transition ceremony. Spock is bummed that he’ll no longer be serving under Christopher Pike, who he thought was pretty okay for a human. Sulu thinks he’s about to report to the Aerfen for some frontier action, but he gets a rude awakening when Kirk requests him specifically to be his helm officer, and he keeps getting waylaid in his attempts to get someone to do something about it. McCoy has gone off the grid and is kayaking like he’s the “after” guy in a Viagra commercial when he’s supposed to be reporting for duty. Things go from bad to worse at the party celebrating the transition of command, where Kirk overhears Scotty calling him an “inexperienced tyro” (which, apparently, is redundant). So no one respects or believes in Kirk and everyone considers him an impetuous noob. That’ll change once he receives an exciting thrill-a-minute mission worthy of his talents, right? Yeah, about that. Admiral Noguchi has hand-selected a real dilly of an assignment: hosting a troupe called the Warp-Speed Classic Vaudeville Company as they tour starbases and attempt to boost morale along the Federation Phalanx, a finger of Federation space that pokes audaciously into Klingon territory. So Kirk has to bend over backwards to accommodate a bunch of carnies specializing in a form of entertainment almost no one in the 23rd century has even heard of, nobody likes him, and his shuttle bay is being rented out as a barn for a pegasus—sorry, an equiraptor (no, not that one). It’s a little like “Up the Long Ladder”, except far less stupid. Kirk starts out yelling at Lindy Lukarian (the leader of the company) and resenting her need to keep her stupid eagle-horse comfortable, but things get complicated just as he starts warming up to her when they rendezvous with Stephen, a blond-haired, blue-eyed Vulcan who according to Spock “seeks out emotional experiences”, and not just basic stuff like laughing or owning a cat or adopting a Terran nom de plume, but actual thrills like juggling torches and doing insane stunts in his beat-up shuttlecraft. Spock admits Stephen is brilliant, but naturally disapproves mightily of his choices and feels he’s putting his considerable talents to waste. He also mentions Stephen coming from an “unobjectionable family”. Like, of course Spock knows him somehow. Having read these books for a while now, Spock is getting to be sort of like that offensive stereotype of one person knowing all people of their race, except in his case it’s kind of true. Anyway, if you’ve ever wondered what it looks like when a Vulcan decides to live way off the beaten path, Stephen definitely delivers, but naturally, he’s got a lot of inner turmoil as well, and I really enjoyed just about everything involving him. Meanwhile, a Klingon woman named Koronin has gone rogue and commandeered a shiny new warship called a … a, uh, “Bird of Prey”? or something? Never heard of it. She has some vaguely vengeance-based plans for it that involve the same thing most generic megalomaniacs in Star Trek get up to: crossing borders, inciting intergalactic war, all that noise. But if you think McIntyre is going to attempt to posit this normally extremely commonplace ship as some unprecedented harbinger of destruction and try to egregiously hype up what would otherwise be a bog-standard space battle, you’ve got another think coming. For one thing, Koronin is one of those “wait and see” Klingons whose subordinates practically soil themselves with impatience, and she does a lot of waiting of seeing before making her play. But also, the Klingons are far from the most important thing going on in this story. Nearly everything about the Klingons is incidental compared to the real meat of the story, which is a first contact with a group of extremely weird, hyper-sophisticated aliens. We’re talking Duane-level trippy here. They live in a massive worldship that’s so technologically advanced that when it moves, what’s actually happening is that the universe is moving around it. They’re really nice, albeit oblivious and uncomprehending toward human concerns (understandable, given how ka-ray-zee advanced they are). When they beam over to the Enterprise, the gravity nearly crushes them, and in the process of preventing one from falling, Spock accidentally mind-melds with her, frying his mental circuits and setting up the main dilemma of the book’s second half. As I mentioned earlier, Enterprise: The First Adventure is the first of what are often called “event novels”, or sometimes “giant novels” (I prefer and use the former). These are books of expanded length and scope that take on subject matter of significantly higher stakes and far-reaching implications than your average standalone novel. From 1986 onward, they generally crank out about one or two a year—more if you include episode and movie novelizations as being within the purview of the term—and they’re almost always (at least, of the ones I read prior to starting this site) of very to extremely good quality. That’s not exactly surprising; despite the inconsistent quality of Star Trek novels (particularly in this era), the folks behind the scenes had a strong sense not only of who their best writers were but exactly which one(s) to choose to write a given story. Of course, a substantial amount of the story’s conflict derives from the fact that Kirk and the senior bridge crew are very much getting off on the wrong foot. On the most superficial level, this results in wryly ironic lines like “Jim probably would not have much interaction with Commander Spock” (p. 44) and prototypical variations on beloved dynamics (e.g., McCoy’s first needling of Spock essentially boils down to “u mad, bro”). But Vonda McIntyre really rose to an unenviable challenge. Many books have a one- or two-character handicap, but imagine having to write one where no one’s personalities as you and millions of fans have known them for decades are locked in yet. McIntyre’s greatest accomplishment is that despite not having the option of falling back on that comfy familiarity, she keeps everyone totally in character with nary a slip-up, even as they’re grousing and gossiping and generally not really liking each other very much. There’s nothing really unexpected about Enterprise: The First Adventure or the way it plays out, but it’s made up of a pretty excellent collection of component parts that keeps the pace fun and buoyant while still leaving room for excitement and suspense when the situation calls for it. And it progresses realistically, by which I mean you don’t make it to the end of the book and suddenly everyone is all chummy and the personalities we’re used to are set in stone. Kirk manages to earn his crew’s grudging respect, if not their total admiration. It’s not a story where everything is supposed to resolve tidily, and it doesn’t. Were I writing this story, I would identify my main goal for the end of the story as putting the characters on a path that provides a clear line of sight to their canon dynamics while ensuring it tracks with everything that came before it. Enterprise: The First Adventure achieves that goal in the same way that its crew passes their first mission: with flying colors. 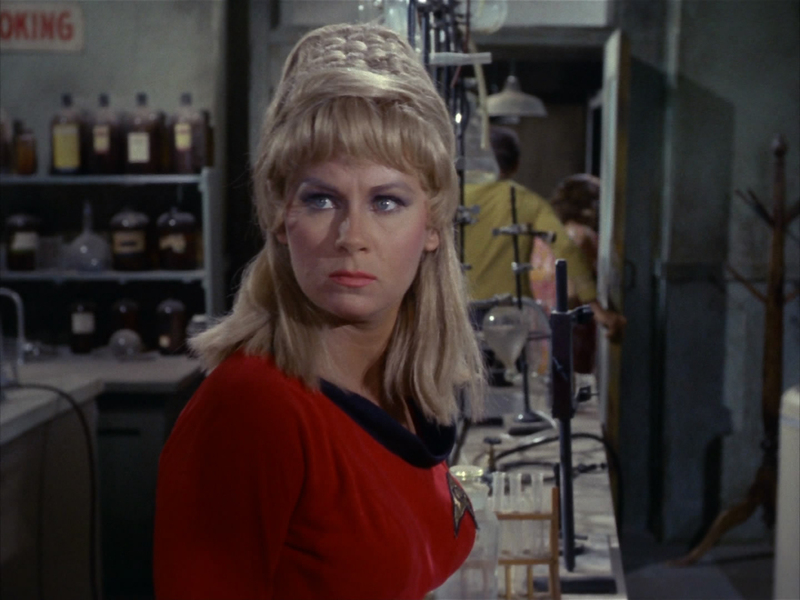 We need to talk about Janice Rand. Like, what the what? If people are still using the phrase “hot mess” in the 23rd century, they’re definitely calling her one. She doesn’t have her iconic checkerboard beehive, but rather a choppy weed-whacker cut; she lied about her age to get into the Academy because the planet she lived on sucked that much; and she’s ultra-timid and jumpy, has zero self-esteem, and apologizes so much it makes Kirk angry (though to be fair, in this book, a lot of things do that). It’s briefly questioned how someone like her could have even made it through the Academy in her state, although it’s handwaved by saying that basically Starfleet’s recruitment rate is such that they don’t have the luxury of turning down people who want to join, and if a few of them have a crippling neurosis or two or three or seventeen, then so be it. Still, that doesn’t put the question to rest in a satisfying manner. I think of all the character arcs, hers is the only one that when all is said and done is too difficult to reconcile with where we know the character ends up. Still, the subplot involving Rand’s cruel roommate is consistently hilarious, since it’s always delicious to see jerks get their comeuppance, especially over and over again. Koronin has a pink monkey-type pet she contemptuously names Starfleet, whom she sometimes deigns to feed if he puts his uniform on correctly. Pretty darned on-the-nose, sure, but amusing nevertheless (and he gets a surprisingly affecting redemptive arc). p. 314: “[The flying people] understood [their worldship technology] so well that they thought about it as often as they thought about breathing. They did not need to think about it. And so they had freed themselves to concentrate on a life of the mind.” I know a guy who’ll show you the life of the mind. I give Enterprise: The First Adventure 4.5 out of 5 neo-Shakespearean monologues. By no means does J.J. Abrams have the market cornered on Enterprise crew origin stories. A blurb from the Great Bird himself adorns the back cover, and he’s not just whistlin’ Dixie. Enterprise: The First Adventure reminds you why Vonda McIntyre is the one Trek author that gets the lion’s share of the shoutouts and callbacks from other Trek authors. If you’re interested in what a non-Kelvin take on the Enterprise crew’s first mission together would look like, Enterprise: The First Adventure is just what the doctor ordered. (Depending on how charitable your attitude is toward that film, you’re liable to find the book to be the superior take.) Unfortunately, McIntyre’s Pocket Books run has just about reached its end; we’ve got just one more movie novelization to go before that duty gets turned over to J.M. Dillard. NEXT TIME: Get ready to man your post for Battlestations!